This year marks the sixth MASH, a student-run, campus-wide music festival where University bands can be heard from many different venues, ranging from stages near Olin Library to North College to the Main Stage on Foss Hill. The Sept. 9 bash has adopted a new look, now facilitating community art response pieces to be performed and created in reaction to the live acts scattered across campus. The music also serves as the end route and creative accomplice of the Main Street Stroll, another CFA-funded activity that morning. 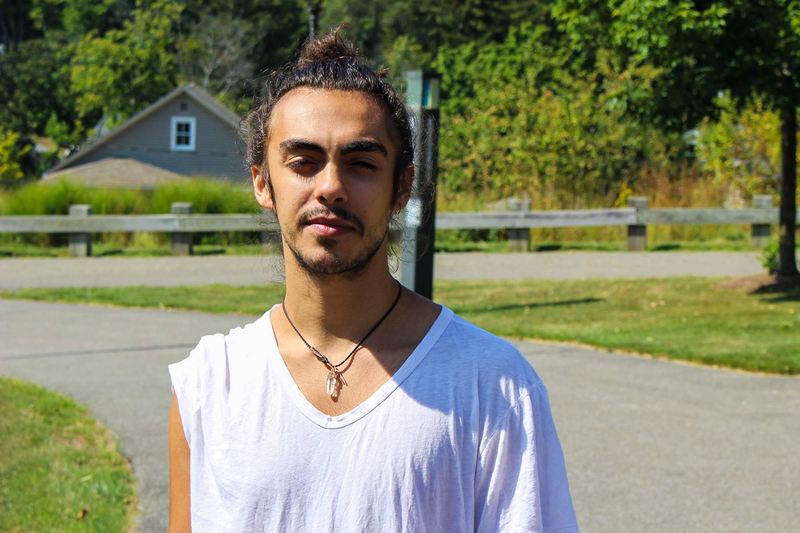 The Argus sat down with MASH Student Organizer Harrison Nir ’19 to discuss organizers and new partners working behind the scenes, some of the changes he’s brought to the festival, and Nir’s hopes for the all-day multimedia event. The Argus: What are you working on and what’s your role in festival prep right now? Who else is on the organizing team? Harrison Nir: I see myself fitting in as the social media intern. Doing the laborious emailing for everyone, [also] as the social media personality slash the student representative. I’m a part of a 5-person team. While it’s a student-run festival, it’s not a student-funded festival, so everything is overseen by the CFA. It’s Hanna Oravec behind the curtain. She’s basically the director [of the MASH]. John Elmore is the Wesleyan CFA Media Director and he helped design the poster [along with Giorgia Sage ’18]. He does the finishing touches on all the graphic design work. Andrew Chatfield is a communications and CFA worker who is the CFA social media coordinator. TA: How involved is WESU in advertising and supporting the MASH? HN: I met with them before the end of last semester with the intention of having them be a cross-posting promotional partner. I’m going to promote the WESU open house which is happening on the same day. Something that’s happened this year that’s creating a new scene for the MASH is the Middletown Stroll, which is a big open house on Main Street constructed by the Wesleyan CFA around R.J. Julia Booksellers opening up. Local businesses will have discounts all up and down Main Street. Also live music [will be] happening at the Buttonwood Tree, and art on display at tons of galleries. Rani Arbo of the CFA, who’s friends with [WESU Director] Ben Michael, so the station will be tabling down on Main Street as well. The Stroll then heads toward WESU for an open house, which serves as a link between Main Street and the MASH. Hopefully, those who make it up the hill will check out the record collection and then head up to the MASH where WESU is going to be filming a Facebook live of the event. TA: How about Reverberations’ involvement in the MASH? HN: The two co-founders and editors [of the new publication], Linnie Halpern [’18] and Sage Marshall [’19] are going to be the M.C.s on the Olin Stage. Something that’s very different about this year is that there’s an art fair theme, which came out of a conversation I had with Alex Lee [’17] on his student group Greyscale because I wanted input on how to make the MASH more participatory. The idea was to get people responding to the MASH so that not only the people performing on stage had voices at the festival, but rather everyone had an opportunity to express themselves and come as an active community member. To have something to say if they did and have a way to express it aloud if they wanted. TA: How will you facilitate these art responses? HN: Reverberations is going to be publishing visual art and written responses. They’re going to have journals at a table near the Olin Stage. Sage will M.C. and Linnie’s going to encourage people to use the open journals provided. There’s also going to be poets performing on the Olin Stage. The North College Stage will have two visual artists making art in response to the music that’s being played. Each artist will perform 50-minute sets working on a huge sheet of paper near the stage. It also goes to plan, we will also have the Usdan chalk-cube up to inspire artists in the audience. I wanted to get a live dance on the Main Stage, something that really didn’t come through with the amount of time we have on campus before the event. However, Prometheus’ fire dancing will be performed after the headliners on the Main Stage. Hopefully, in years to come, there can be live dance response, which I don’t think I’ve ever seen at Wesleyan. I’d love to “mash” those worlds, bringing together different sects of the creative community on campus through multiple avenues of artistic response. TA: Who in the organizing team behind the MASH has been pushing for this new theme of art response? HN: It’s something I came into the job thinking about and pushing for. I was talking a lot with [previous Student Organizer] Nyanen [Deng ’17] about what she was going for last year and she was more for representation [of a diversity of genre and identity on stage]. I definitely riffed off of the things that Nyanen did and grew out of her generous advice. For me though, with this “arts fair” model, the thought was that more slots representing more than just the music scene would bring out a diversity of thinkers and creators. Looking back, I wonder if I could have done that without changing the identity of the MASH as a music festival. I got one complaint inquiry about that. TA: What were they criticizing? HN: It was more about how there [are] so many musicians on campus that don’t get stage time, airtime. The MASH is supposed to be about music. I know it still is and, as a musician on campus, I treasure that and agree, but at the heart it’s still about the music. The music is the catalyst: All of the art is in response to the music. TA: Is there a MASH mission statement? And if so, do you see these new mediums straying from that? HN: I think the founding MASH sentiment is based on World Music Day, you know Fête de la Music, a street music fair in Paris—I think. So this year’s art fair doesn’t sound too far off. At its core, it is an event put on to celebrate Wesleyan music. I think the mission comes from an evolving student culture, majorly what each student organizer passes down each year to the next. TA: Now that it’s winding down to last week crunch time, if you were organizing for next year, what would you change? Anything you’d like to add? HN: Again, if this arts fair theme catches on, I would love to get dance at the MASH. I don’t know if I would run it next year only because though it’s definitely familiar to me now, I like the idea that as a legacy, the festival job evolves with a new thinker in charge each year, who can call me for advice as I called Nyanen. I really hope that the MASH and this new response culture can fire people up in terms of inspiring collaborative projects. I hope the collisions that will happen on that day can lead to great performances in the future. I hope people regard it as a moment of combustion, as a creative checkpoint for beginning the semester and the year.